The Irish ambassador to the United States will visit the College of Charleston to give a public lecture on BREXIT. Join us for a learning session to cover all aspects of gameplay and rules. Drs. Cara Delay (History) and Joe Kelly (English) are co-directing the 2019 Southern regional meeting of the American Conference for Irish Studies. (The ACIS is the professional organization for Irish Studies in the U. S.) More than 50 scholars from the region, the nation, and the world will gather to discuss the theme "Home and Away: Imaginings and Experiences." The public is invited to panel sessions and keynote address (see below). For a detailed program, visit the Irish and Irish American Studies blog. The first concert in a new, annual series will be held at 7pm, 31 January 2019 in Alumni Memorial Hall (in CofC's main building, Randolph Hall). Andrew Finn Magill is from Asheville, NC, and he plays fiddle like he's Irish. Dave Curley hales from County Clare. Enjoy an evening of their unique blend of strumming, fiddling, singing. Reception at 6:30 and the program starts at 7pm. Tickets are $15 and only 40 are available to the public. Reserve your seat today! The College of Charleston Irish Studies program will have Professor Dominic Bryan of Queen's University Belfast in town giving a lecture. Lots going on in St Patrick's Day in Charleston, Mass is 8am at St Patrick's Church downtown. Be sure to take a look at the gravestones adjacent to the church, lots of Irish buried there from the 19th. The parade begins at the church following Mass. At noon the Irish flag is raised about city hall and there's a ceremony for that. While in the area stop by the Irish Memorial Park on Charlotte Street. It's one of the best nights of the year on the Charleston Irish calendar, Derek Warfield and the Young Wolfe Tones at the music hall. We'll be up on the balcony same as last year. Gerry & Kelly will be our hosts for February. We are still confirming the dates and full details. Seanachai is the closest thing you'll get to a real pub in Ireland so don't miss this one. We are at Prohibition this month out on the back patio with Finbar flying in from Wisconsin to sing. Always a great night. See you all there. Gaelic Storm is a Celtic band. Their musical output includes pieces from traditional Irish music, Scottish music, and original tunes in both the Celtic and Celtic rock genres. This is the big one, first leg of the playoff to get the World Cup. Since St James Gate was a lucky venue for the game v Wales, we are heading back there, so come to the beach Saturday and watch us beat the Danes. 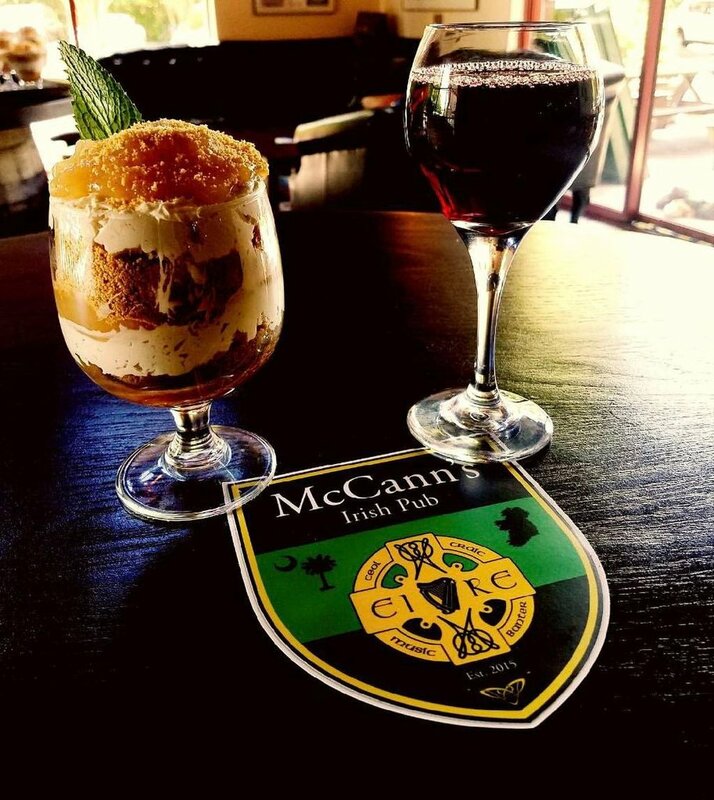 As if the hurlers can't get any scarier, they are having a Halloween party at the newly opened McCann's Irish Pub @ Seabrook. On a rainy October afternoon in 2011, club co-founders Brendan and Ryan met at the park to hit around the sliotar. Six years have passed since that fateful afternoon, all the while our club continues to grow and spread the glorious game that is hurling. Come out for a pint or a PBR to celebrate the sixth anniversary of the Charleston Hurling Club. Attendees can expect a wee-bit of story time from longtime members. If you're interested in learning more about the hurling club, members will be in attendance to answer any questions. This is a great opportunity to experience some excellent Irish music and have a wonderful time!! This is a great chance to meet some of the Charleston Irish and experience Irish culture here in the low country! Charleston Irish are going on tour ! We have been invited to the soft opening of Prohibition in Savannah. This is our biggest meet up of the year, celebrating halfway to Paddy's Day, so if you haven't been to a Charleston Irish monthly event yet, be sure you come to this one. We've made it a very big event, Finbar McCarthy is flying in from Wisconsin to sing along side very special guest, Dan O'Sullivan, from Derek Warfield and the Young Wolfe Tones. Tommy Snee will be performing and as always, Jerry 'Ringo' Lynch will be on the drum. Other guest appearances as the night goes on too. Guinness will be engraving pint glasses too. James, Ray & Jim will be our hosts in the back patio at Prohibition. The craic will be mighty. See you all there. Our July Charleston Irish meet up will be another family friendly afternoon event. Danny, Ciara & Gianni will be taking a break from working on their new Seabrook location to be our hosts. Finbar McCarthy & the Charleston Irish band will be performing as usual and we have a special guest, Brendan O'Connor, who will be joining us onstage. Brendan is a retired NYPD Officer and Ground Zero first responder as well as a brilliant musician. The world renowned Druid Theater will be headlining the Charleston Spoleto Festival this year, performing Samuel Beckett’s Waiting for Godot at the Dock Street Theater. They will be performing from 25 May - 11 June 2017. The Charleston Irish night will be on Friday May 26th, when the Irish Consul General for the SouthEast, Shane Stephens will be in attendance. Druid returns with its acclaimed production of Waiting for Godot in spring 2017. Regarded as one of the most significant plays of the twentieth century, Waiting for Godot by Samuel Beckett is a masterpiece that draws endless interpretations. Our monthly get together is a family friendly event this month since we are holding it on a Sunday afternoon at Prohibition. Finbar McCarthy is flying in from Wisconsin to sing with the Charleston Irish band. Prohibition, owned by the Belfast lads James, Ray & Jim, just extended their patio and we will hosting the event out there. Come meet your fellow Irish and listen to the songs. The Charleston Hurling Team will be traveling to Greenville on Saturday to compete in the Greenville tournament. • Each Game will be 45 minutes in length (20 minute halves and a 5 minute half time period. • Each team officiating will be responsible for a field ref (1), back judges (4), and line judges (2). • At the end of each match winners and points for both teams will be turned into the chairman from Greenville. • Tie Breaker if same record will be total points scored against. • The youth Blitz will start at 11:00 on the field next to the main field. We are happy to host the Holy City Cup in our great city of Charleston on Saturday, April 22 at our old stomping grounds at the Danny Jones Complex where it all started. Format will be similar to how it has been in the past: 11 a side, Junior C rules (no more than 3 Irish on the field at a time), co-ed teams are welcome. Unfortunately, due to the field and time constraints, we will not be able to field a full camogie tournament as we did last year. For those who haven't been to the field before, there is enclosed bathrooms and concessions. We will have the grill going and non-alcoholic drinks and snacks for purchase. There is no alcohol or pets allowed at the field. Stay tuned for information about our after party. We look forward to having y'all back in our fair city. If you can send a squad, please let us know by April 15 so that we can schedule accordingly. Thanks! Ireland play a massive World Cup Qualifier in Dublin v Wales and Gareth Bale. We've had a great start to the campaign and a win here will keep us in good shape to qualify for Russia 2018. Following sell-out shows in the Northeast, Rockin’ Road to Dublin is coming to Charleston on their first national tour! Come see the show that Irish Dancing Magazine calls “WORLD CLASS ... a one-two punch of style and mastery ... they made some magic here”. Rockin’ Road to Dublin is the new sensation that combines the art of an Irish dance show, the power of a Rock-N-Roll concert, all with the finish of a Broadway theatrical production. Starring World Champion Irish dancers Scott Doherty and Ashley Smith, the cast includes 14 dancers, 8 musicians and two vocalists. This is a College of Charleston Irish & American Irish Studies program event. St. Patrick’s Day has become a festival of all things Irish, from music and dance to food and drink. But amidst the revelry, it is worth remembering that the day commemorates a remarkable individual who lived in the fifth century. Patricius son of Calpornius was a Christian bishop from Britain who left his comfortable home to dedicate his life to spreading the faith in Ireland. This is all the more astonishing considering that Patrick’s first encounter with the Irish had been when they abducted him and sold him into slavery as a young boy. In the fifteen hundred years since he lived and died, myths and legends about Patrick have come to dominate the public perception of who he was and what he did. In this lecture, these legends and their meanings will be discussed on the way to investigating the real St Patrick, his life, his mission, and his achievement, as described in his own words. Derek Warfield and the Young Wolfe Tones will be playing at the Music Hall. Closer to the date, we'll arrange a pre-concert few pints somewhere. A native of County Galway on Ireland’s west coast, Whelan's first book was “The Bible War in Ireland. The ‘Second Reformation’ and the Polarization of Protestant-Catholic Relations, 1780-1840” published in 2005. Prof. Whelan is an active scholar and keeps a consistent foothold on both sides of the Atlantic; she spent part of her recent sabbatical as a visiting scholar at Maynooth University in Ireland. Her scholarly focus is on the intersection of religious and political history at the local as well as the global level. She is currently engaged in co-editing a volume of essays, “Landscape of Promise and Ruin: Culture, Identity and Reality in the Irish West, 1830-1930” as well a book-length study of the concept of an Irish ‘spiritual empire’ in the 19th and 20th centuries. The Lowcountry Irish Festival is a musical and cultural Irish Festival celebrating all things uniquely Irish in the South Carolina Lowcountry. From some of Charleston's founding fathers to Irish plantation owners and laborers. From Irish pirates to the Irishmen who powered the HL Hunley with their bare hands.